Home → Inspiration → Who do Kids Belong to? 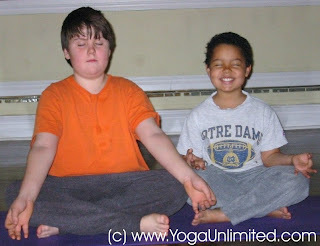 This picture really shows how much kids enjoy meditation. Over the years teaching kids I’ve seen how deeply kids can experience yoga and meditation. It slowly became a passion for me to hold the space for kids to experience their inner world. I started teaching kids yoga classes that were all play and games. Then began introducing the powerful concepts of yoga that I learned from my Teachers. These ideas transformed my life, and I wanted to give kids more than pretending and playing. I wanted them to know for themselves this beautiful phenomenon to awaken their creativity and imagination. We live in a world we have imagined and created. We can change our world by changing our Imagination. If kids feel the power of their Imagination they realize they can create their world the way they want it to be, not the way others are telling them it has to be. Let’s give kids an antidote to all the doom and gloom they are surrounded with. To have an external world that represents their internal world. To show them how they can create their internal world using yoga and meditation to be a world of peace and also bliss. Their internal world will be reflected in everything they do. “We treat our children like a piece of furniture that we own. No, our children are gift to us from God, they are the property of God. And they should be directed to understand God, whom they belong to. This is what inspired me to create the Teaching Kids Yoga blog and the Teaching Kids Yoga Training Course. The more people who carry this beacon of hope, then we can have a powerful generation of kids who understand who they really are, who understand their Divinity, and their power to create a new world for themselves. They will create their world. The way they want it to be. What yoga teachings inspire you and how do you pass them on? You have to know it to teach it. The weekend will be a transformational experience for teachers to pass on to kids based on these teachings of the Masters.